From the Montreal Neurological Institute (V.M., J.P.R., A.A., P.A.D., G.A.R., Z.G.-O. ), Department of Human Genetics (J.P.R., A.A., G.A.R., Z.G.-O. ), Department of Neurology and Neurosurgery (P.A.D., G.A.R., Z.G.-O. ), McGill University, Quebec, Canada; Department of Neurology and Taub Institute for Research on Alzheimer's Disease and the Aging Brain (R.N.A. ), College of Physicians and Surgeons, Columbia University, New York, NY; and Section on Molecular Neurogenetics (E.S. ), Medical Genetics Branch, National Human Genome Research Institute, National Institutes of Health, Bethesda, MD. The lysosomal enzyme glucocerebrosidase (GCase), encoded by GBA, has an important role in Parkinson disease (PD). GBA mutation carriers have an increased risk for PD, earlier age at onset, faster progression, and various nonmotor symptoms including cognitive decline, REM sleep behavior disorder, hyposmia, and autonomic dysfunction.1 Furthermore, GCase enzymatic activity is reduced in the peripheral blood2 and brain3 of noncarrier, sporadic PD patients. Biallelic GBA mutations, which have been classified as “severe” or “mild,” may cause Gaucher disease (GD), a lysosomal storage disorder. Mild mutations may lead to GD type 1, and 2 severe mutations result in neuronopathic GD (type 2 and type 3).4 There are 2 GBA variants, p.E326K and p.T369M, which do not cause GD in homozygous carriers, but may modify GCase activity and GD phenotype. It is now clear that p.E326K is a risk factor for PD,5 but whether p.T369M is associated with PD is still controversial. In some studies, the p.T369M substitution was associated with PD,6 while in others it had similar or increased frequency in controls. Of interest, it was recently demonstrated that the GBA p.T369M substitution was associated with reduced enzymatic activity in patients with PD and controls compared with that in noncarriers (7.64 vs 11.93 μmol/L/h, p < 0.001).2 Of interest, it was even lower than the average enzymatic activity of the p.E326K substitution, which was 9.81 μmol/L/h. Because clinical trials on GBA-associated PD are ongoing, and because treatment specifically targeting GBA is likely to be available in the future, it is important to determine whether the GBA p.T369M substitution is associated with PD. In the meta-analysis, the GBA p.T369M allele was associated with an increased risk for PD (OR = 1.78, 95% confidence interval [CI] = 1.25–2.53, p = 0.002, figure 1A); however, the heterogeneity was statistically significant (Tarone p = 0.01). The heterogeneity was mainly introduced by 2 cohorts with the highest and lowest extreme values; one had 10 GBA p.T369M carriers in the controls (allele frequency of 0.021) and none in patients, and the second had 17 carriers among the patients with PD (allele frequency of 0.018) but none in controls (additional details in table e-1).7 After removing these outliers, a total of 4,320 patients and 2,925 controls remained, and the heterogeneity was eliminated (Tarone p = 0.28). The p.T369M allele frequency was 0.011 in patients and 0.0066 in controls, with an OR of 1.74 (95% CI = 1.19–2.55, p = 0.0059, figure 1B). The allele frequency of p.T369M among controls in the current meta-analysis (0.0066) is similar to the allele frequencies in the 1000 Genomes Project (0.005) and Exome Aggregation Consortium (0.0065). 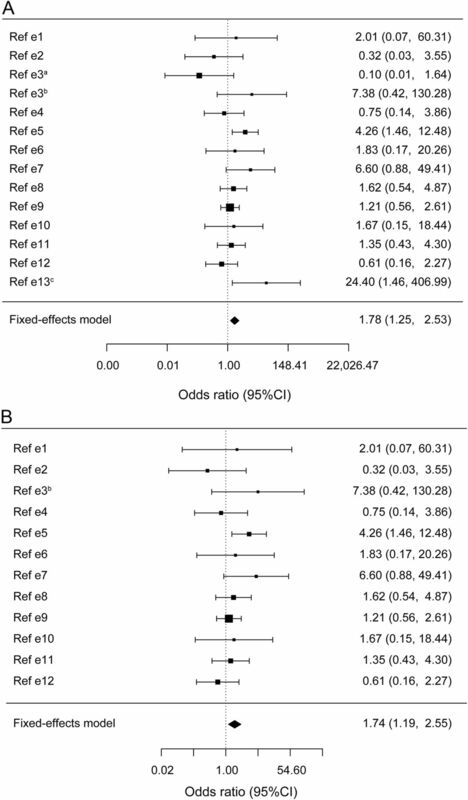 Although fixed-effect model is probably a better estimate of the risk in this case, random-effect model was also performed, demonstrating only a trend (OR = 1.55, 95% CI = 0.96–2.50, p = 0.07 for all 14 studies, and OR = 1.54, 95% CI = 0.99–2.40, p = 0.056 after removing the 2 outliers). (A) Forest plot of meta-analysis of 14 case-control cohorts including 4,920 patients with Parkinson disease and 3,500 controls with data on the GBA p.T369M substitution (references and details on the cohorts are in the supplemental data). The Cochran-Mantel-Haenszel test was performed, and the pooled odds ratio (OR) was 1.78 (95% confidence interval [CI] = 1.25–2.53, Cochran-Mantel-Haenszel = 9.63, df = 1, p = 0.002). Heterogeneity is statistically significant (Tarone test, χ2 = 26.84, df = 12, p = 0.01). (B) Forest plot of meta-analysis of 12 case-control cohorts including a total of 4,320 patients and 2,925 controls with data on the GBA p.T369M substitution, after excluding the 2 outliers cohorts that introduced the heterogeneity (see supplemental data for details). The Cochran-Mantel-Haenszel test OR was 1.74 (95% CI = 1.19–2.55, Cochran-Mantel-Haenszel = 7.58, df = 1, p = 0.0059), and the heterogeneity was not statistically significant (Tarone test, χ2 = 13.88, df = 11, p = 0.28). These results suggest that the GBA p.T369M substitution may be a risk factor for PD, with a minor effect, similar to that of common genetic variants identified in genome-wide association studies. Therefore, the risk for PD among GBA p.T369M substitution carriers is only slightly elevated as compared to the general population, and the vast majority of carriers will not develop PD. Furthermore, additional studies that include the GBA p.T369M substitution are necessary to reach a better estimation of its risk. This observation may have some important implications, especially once GBA-specific treatment will become available. Based on the current results and the reported reduced GCase activity in carriers of GBA p.T369M, patients with PD with this substitution may be considered for clinical trials of GBA-associated treatments. The observation that variants not known to cause GD are associated with PD may imply that the mechanisms underlying the 2 conditions are different. However, it is also possible that the same mechanism is involved, yet the effect of this variant is too mild to cause GD, but together with other genetic and/or environmental factors, it enhances the risk for PD. Further studies aimed at understanding the mechanisms underlying GBA-associated PD may elucidate the role of this alteration in PD pathogenesis. Author contributions: Ms. Mallett and Mr. Ross: study concept and design; acquisition of data; analysis and interpretation; and critical revision of the manuscript for important intellectual content. Dr. Alcalay: analysis and interpretation and critical revision of the manuscript for important intellectual content. Ms. Ambalavanan: acquisition of data; analysis and interpretation; and critical revision of the manuscript for important intellectual content. Dr. Sidrnasky: acquisition of data and critical revision of the manuscript for important intellectual content. Dr. Dion: critical revision of the manuscript for important intellectual content. Dr. Rouleau: critical revision of the manuscript for important intellectual content and study supervision. Dr. Gan-Or: study concept and design; acquisition of data; analysis and interpretation; critical revision of the manuscript for important intellectual content; and study supervision. Study funding: No targeted funding reported. G.A.R. holds a Canada Research Chair in Genetics of the Nervous System and the Wilder Penfield Chair in Neurosciences. Z.G.-O. is supported by a postdoctoral fellowship from the Canadian Institutes for Health Research (CIHR). Disclosure: Ms. Mallett reports no disclosures. Mr. Ross has received research support from the Canadian Institutes for Health Research (CIHR). Dr. Alcalay has received consultancy and travel fees from Sanofi-Genzyme and Prophase; and has received research support from NIH, the Brookdale Foundation, the Michael J. Fox Foundation, the Parkinson's Disease Foundation, and the Smart Foundation. Ms. Ambalavanan reports no disclosures. Dr. Sidransky has served on the medical advisory board of the National Gaucher Foundation; has served on the editorial board of Molecular Genetics and Metabolism; and has received research support from NIH, NHGRI, and Merck under a Collaborative Research Agreement with NHGRI. Dr. Dion reports no disclosures. Dr. Rouleau has received research support from the CIHR Foundation Scheme, the ALS Society of Canada, and the ALS Association. Dr. Gan-Or has received consultancy fees, speaker honoraria, and travel fees from Sanofi-Genzyme; and has received research support from the Canadian Institutes for Health Research (CIHR), McGill University, and the Michael J. Fox Foundation. Go to Neurology.org/ng for full disclosure forms. The Article Processing Charge was paid by the authors. Accepted in final form August 8, 2016.
. Glucocerebrosidase and Parkinson disease: recent advances. Mol Cell Neurosci 2015;66:37–42. Glucocerebrosidase activity in Parkinson's disease with and without GBA mutations. Brain 2015;138:2648–2658. Glucocerebrosidase deficiency in substantia nigra of parkinson disease brains. Ann Neurol 2012;72:455–463. Differential effects of severe vs mild GBA mutations on Parkinson disease. Neurology 2015;84:880–887. Meta-analysis of Parkinson's disease: identification of a novel locus, RIT2. Ann Neurol 2012;71:370–384. Large-scale screening of the Gaucher's disease-related glucocerebrosidase gene in Europeans with Parkinson's disease. Hum Mol Genet 2011;20:202–210. Multicenter analysis of glucocerebrosidase mutations in Parkinson's disease. N Engl J Med 2009;361:1651–1661.